About 9½km. (6 miles) taking 3 hours. From the car park return to the road and turn right. Opposite Windyway House go over the stile at the corner of the road and a track. Proceed on this footpath which is part of the Gritstone trail for almost 1km. 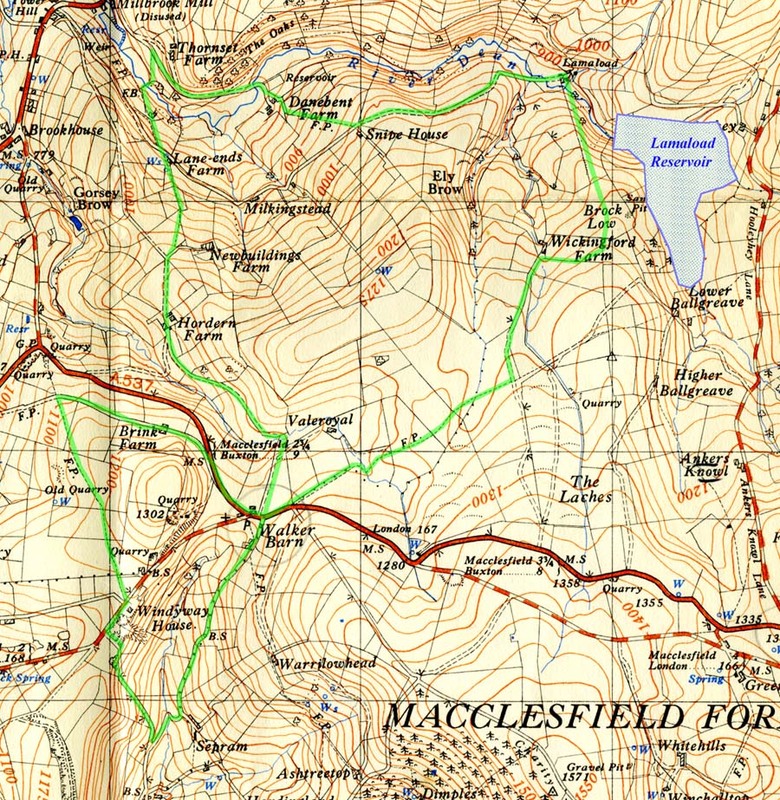 About 100m before the Gritstone Trail descends to the Macclesfield-Buxton road turn right and follow the path which runs parallel to and above the road. Follow the path between a house and a barn as it descends to the main road. Cross the road and follow it for 400m to cross a stile on the left which is immediately behind the Peak National Park Boundary Stone. Keep to the wall on the left and cross the next stile.Bear to the right, across the stream, bear left for 50m and then bear right, round the side of the hill. Follow the path, over three stiles. At this point the splendid views ahead are of the Todd Brook Valley and the ridge on the skyline from Windgather Rocks to Shining Tor, the highest point in Cheshire 559m. (1834 feet). Continue downhill and look for the next wooden stile in a hollow. After this keep straight ahead until the path meets a track. Turn left down the track to Wickenfold Farm. Immediately before the farm take the path to the right through a small orchard and then following a fence on the left leading to a path running besides the stone wall and the fence on the left. Walk up the hill, climb the wooden fence near the first gateway on the left and continue straight on, now with the wire fence on the left, until a stile is reached over the wall in front. Cross the stile and, bearing slightly right aim for the wood ahead. At the wood turn left and follow the path with the wood on the right. Cross the next stile and turn left and head forward, keeping to the left of the stump, for about 200m. to a stile in the wall. Go over the stile and follow the path downhill taking particular care as it can be slippery. At the bottom of the hill bear left between two walls and at the gate cross the stile onto the access road to the water treatment works. Turn left along the road, up the hill. At the top of the hill look for a stile on the right opposite Snipe House Farm. Cross the stile and walk diagonally to the left down hill towards the farm at the bottom of the valley. Before the farm is reached, bear right between two walls and follow the track round to the left. About 15m before the farm go through the stile and continue, with the farm on the left, to another stile on the left by a holly bush. Pass through the stile, turn right, and continue to the gate and down the steps to the lane. Turn right on the lane and cross the bridge over River Dean. Turn left along the lane. Thornset Farm can soon be seen high above the lane on the right. Look for a stile on the left of the lane, roughly opposite to Thornset Farm, cross this stile and through the field, diagonally to the left, down to the river. Go over the stile and then the footbridge then bear left up the hill, with the wall on the left, aiming for the stile at the top left of the field which is situated above and behind the house. Go through the stile and turn left; walk for about 10m. and look for a small gate on the right after about 15m. to the right of the track and on your side of the boundary wall of the house. Pass through this gate and continue uphill, with the wall on the left, and then through a stile at the top left hand corner of the field which leads back on to the road from the water treatment works. Cross the road diagonally to the left and almost immediately on the right, cross the stile in the stone wall. Climb diagonally to the left following the path and passing a house. Continue steeply uphill and look for a stone stile. Cross this and take a step or two to the left, turn right and continue uphill, with the wall on the right to the next stile. Go over the stile and cross the field continuing uphill, with the wall now on the left, bear right across the field to a stile to the right of a gate onto a lane. There are particularly fine views at this point. Look backwards, to the Dean Valley, down the valley to Rainow, Kerridge Hill and White Nancy, Bollington, Pott Shrigley and Nab Hill. Looking forward, the view is across the Cheshire Plain, Alderley Edge and Jodrell Bank Telescope. Cross the stile, turn right on the lane and keep to it after it bears left and becomes a fenced track to Horden Farm. Continue through the farmyard and go through a gate into a grass track. Follow the grass track, first with the wall on the left and then when this finishes carry on with a broken wall on the right. This attractive valley is Gulshaw Hollow, the path follows the wall to a stile, across the stream and uphill, with the wall on the right to Walker Barn on the main Macclesfield to Buxton Road. Turn left and immediately right into a road to return to Teggs Nose. Walk along the road for about 1km, descending to a stream. Shortly after crossing the stream turn right and walk up a steep stony path back to Teggs Nose car park.